Theater in the Now: Restoration Comedy: Back at the Kiki! 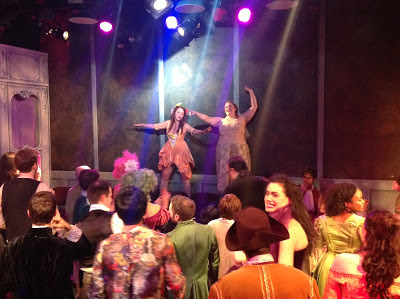 Restoration Comedy: Back at the Kiki! Boy how a play in development can change within days! Only five days ago I attended my first sneak peek of The Flea’s Restoration Comedy and since then elements were added, and in some cases eliminated, to make way for the glorious first preview! I arrived early to get the inside scoop of how the rest of tech and dress rehearsals went and got to officially meet some of the cast members, all of whom you’ll meet in a special segment called “Kiki Time with…” I got to see how some costumes and scenic pieces developed since last I saw. But what struck me the most was how welcoming everyone was, despite me potentially getting in the way as they’re preparing for their first preview. The entire cast, crew, and team at The Flea are beyond generous and hospitable. When the clock struck 4pm, it was time for preview number 1 to officially begin, the first time the company gets to perform for a paying audience. Unlike my last visit, this party was going all out. After you pick up your ticket, you get the opportunity to sip some of the wonderful libations provided. The punch is a great way to mix and mingle before you take your seats. As the audience arrives, select cast members are in the lobby greeting everyone as the pre-show entertainment fills the room. You’re encouraged to find your seat and chat with people you don’t know. If you’re usually a shy person, have no fear, the cast will quickly help break you out of that! They also have a keen eye for empty glasses and are willing to fill ‘em up for you. The theater is set up in a thrust configuration so there is not bad seat in the house. Last time I sat on one of the sides, this time I took a spot in the high risers where I did not miss a thing. Not a single piece of skin. One of the fun parts of the night for me was people watching. Since I’ve already seen the show once, I could glance over to the two tiers of audience seating and survey their reactions. And I can tell you, the audience had a marvelous time. Especially during the intermission, with delicious snacks, more drink refills, and merriment through song. But wait until the end of the night for a very special interactive treat! The sense of community that is created with this marvelous evening of theater concludes with a fun dance party. If I could pick any Scissor Sisters song that would describe me, it would be “I Don’t Feel Like Dancing”, mostly because I can’t dance. Or at least that’s what I proclaim. Though the cast tried to get me up and shake my groove thing, I decided to sit this one out and watch. But perhaps next time! It’s really a party and you’re bound to have fun. I can’t wait to return to ResCom!